To celebrate the start of the Moto2TM season, we have added a complimentary Quickshifter, worth over £400 fitted, across the Street Triple range. With £500 TriStar deposit contribution, low rate finance and £1,000 minimum deposit, our TriStar Finance solutions mean addictive everyday riding has never been more accessible. See the Representative Example below or calculate your personalised quote using our TriStar website. 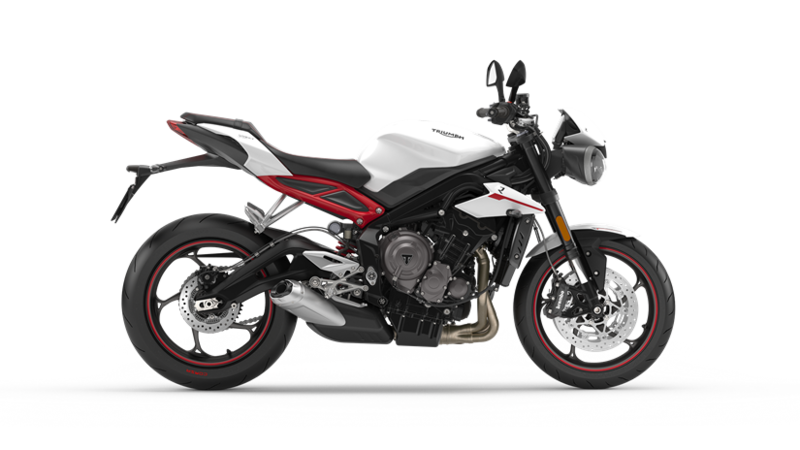 Representative Example is based on Street Triple RS at £85.00 per month. OTHER FINANCE EXAMPLES Over 37 months @ 4,000 miles per annum. Offer subject to availability, subject to change. Offer is available for bikes bought and registered between 01/04/2019 and 30/04/2019. It could be simpler than you think. Get a quote in minutes. Credit is subject to status and is only available to UK residents aged 18 and over. Triumph TriStar is a trading style of Black Horse Ltd. St William House, Tresillian Terrace, Cardiff, CF10 5BH. Finance figures are subject to change. The 6.9% APR Representative offer requires a minimum deposit of 10% or £1,000, whichever is lower and ends 30/04/2019. (3) Part exchange the Triumph subject to settlement of your existing finance agreement; new finance agreements are subject to status. © Copyright 2019 Phillip McCallen Motorcycles. All rights reserved.